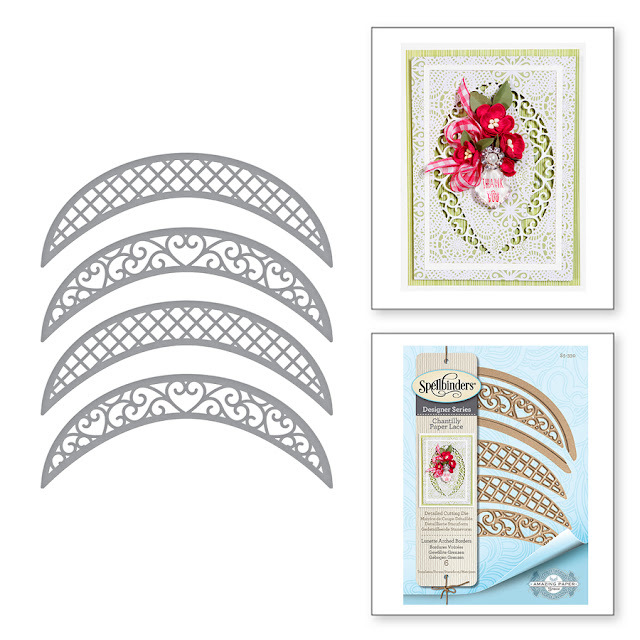 Welcome sweet friends, today we are introducing a new die collection by Becca Feeken for Spellbinders called Chantilly Paper Lace - you can take a quick peek of the entire collection -------> HERE. Have you ever rummaged around in your grandmothers attic, through memories of the past to find sweet letters and cards romantically tucked away for safe keeping while preserving sweet acquaintances and conversations of the past? Letters adorned with the finest decorations, now tattered and ripened with age, impress what an honor it was to receive these treasures. 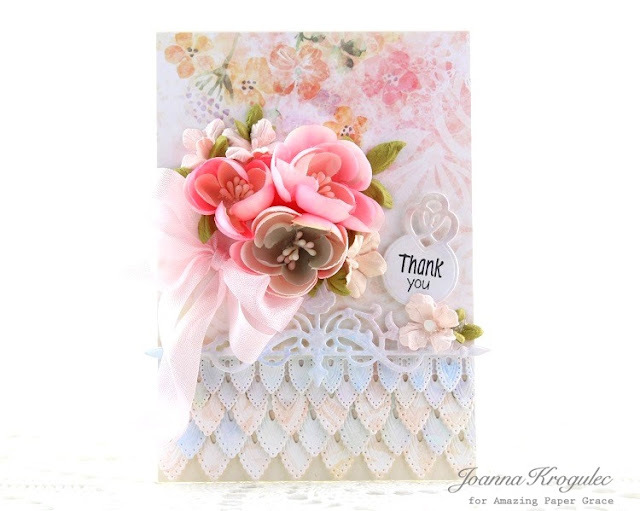 Becca reached into the past to restore some of these treasures, preserving the fine detail, the elegance and the pure femininity into modern day romantic die cuts that are at home on any card. The collection is reminiscent of petticoats, fine lace and adornments and are designed so that each die works with the other. In fact, the card front dies are designed so that they can be used alone or two can be layered over each other. Join us as each Creative Team member shares their creations with two dies from the collection. 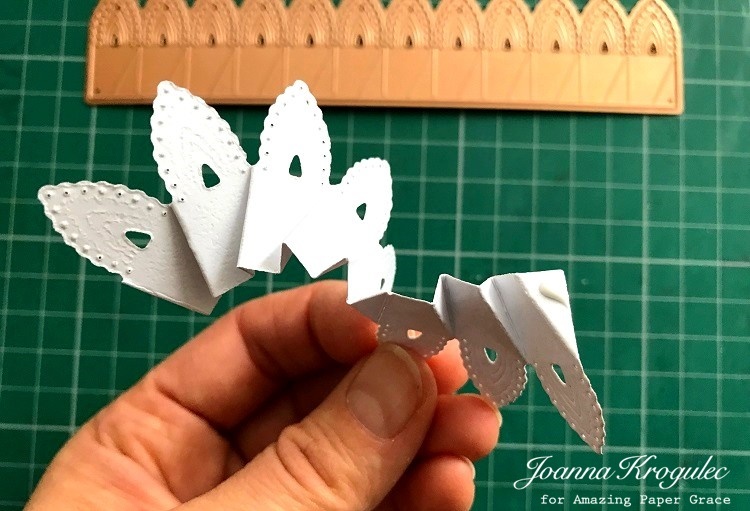 I created two shaped cards using Lunette Arched Borders. You can find Becca's tutorial how to use border dies to create a shaped card - here. To die cut the borders I connected two dies from this set, Lunette Insert and Top Arch Cut die. This card measures approx. 5-3/8'' high by 5-1/2'' wide. The lovely accent, Romantic Loops, which I placed at bottom of this card comes from Spellbinders S4-709 Graceful Corners One and tiny tags are from Spellbinders SDS-053 Graceful Tiny Tags Stamp and Die Set. 'Happy Birthday' card I created the same way like the first card. I just die cut one side of the card. This card measures approx. 5'' wide by 5-3/8'' high. 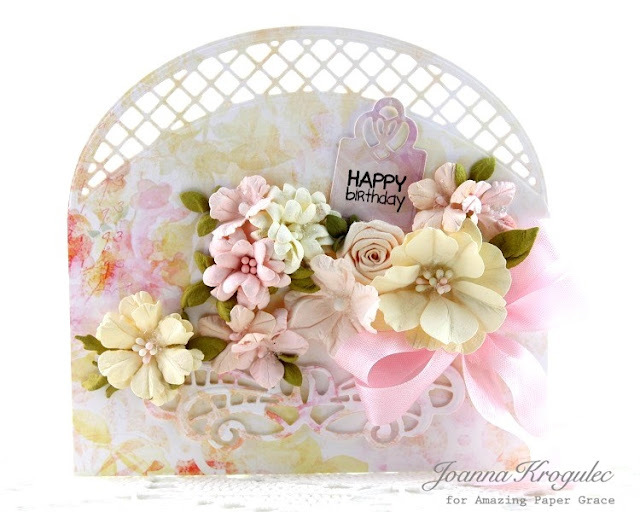 The accent at the bottom of this card and two of the flowers are from Spellbinders S4-791 Isadora Trinkets die set. This is a beautiful die set. 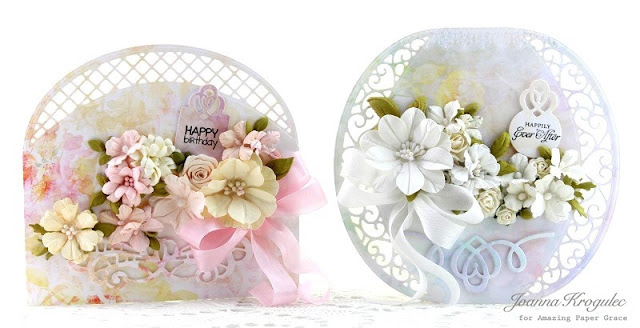 The arches allow to make shaped cards as well as decorate backgrounds by using just inserts. On my first card with Lilly Pearl die I used the die as a border. I die cut three largest borders and two medium ones and arranged them on the card. I did not cut the borders to fit the card base before gluing them down. I did it after all of them were in place. I just trimmed all at once. The decorative accent which is on this card is from Spellbinders S6-078 Regal Allure. My second card with Lilly Pearl die is a card where I used the die as a flower. I created a beautiful lily using all three dies in this set. I also added leaves from Spellbinders S4-792 Cinch and Go Flowers Two and used Spellbinders S5-308 Hemstitch Rectangles as a background for my card. 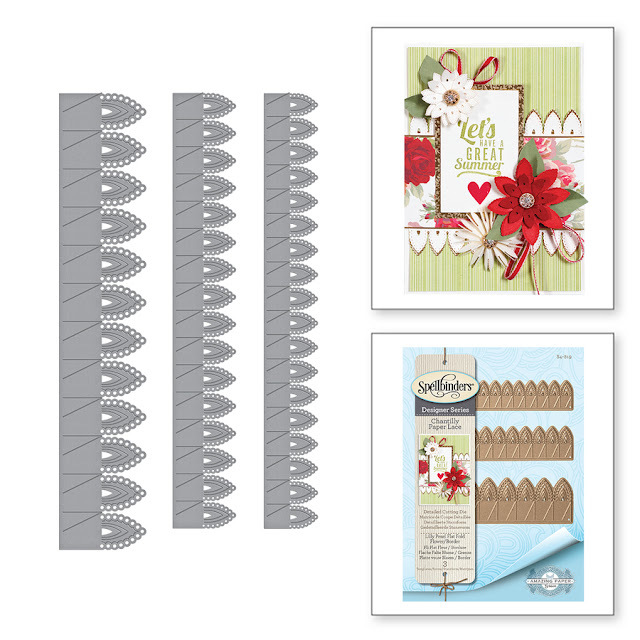 The sentiment comes from Spellbinders SDS-054 Giving Occasion Stamp and Die set. To create lily all you need to do is fold the scored lines and fold the flower with as many petals as you like. 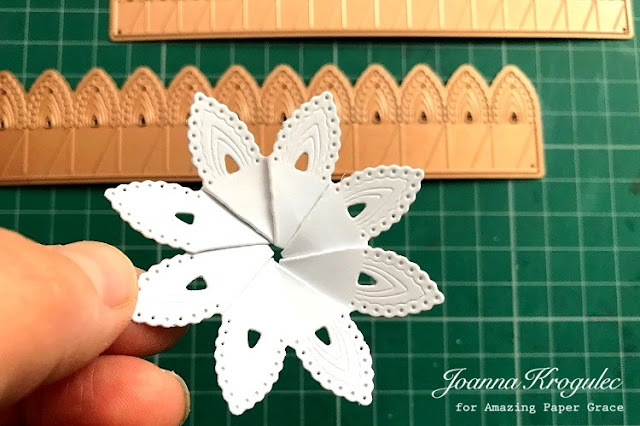 I have eight petals as I noticed that when I was using thick patterned paper (from Blue Fern Studio) the flower closed easier with eight petals. Once the flowers is folded I added a tiny bit of glue at the very end. I twisted a bit each petal on a pencil to give a bit of dimension. I took a few photos to show how to fold the flower. After folding scored lines you need to fold diagonal folds to the left and keep them on the top. Add a bit of glue at the end on the little triangle and glue it on the top of the other end. This is the front of the flower. And this is the back of the flower. 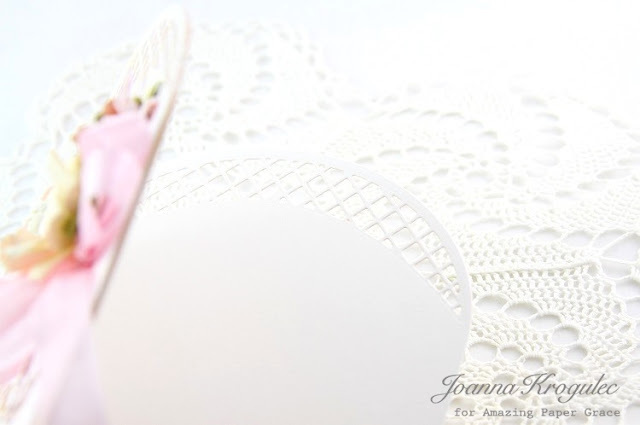 Visit Becca - spellbindersblog.com for your first Chantilly Paper Lace Project including step by step photo instruction. Leave a comment - tell us, which of these dies would is closest to your heart? Beautiful cards love the Techniques you used thanks for sharing. Awesome cards! I especially love your arched boarders shaped card! I saw those arched dies on the website and wasn't sure what to do with them. Your cards give great ideas. The borders are lovely, too. This release is just getting better and better. Wow - simply gorgeous! Thanks for sharing the flower! 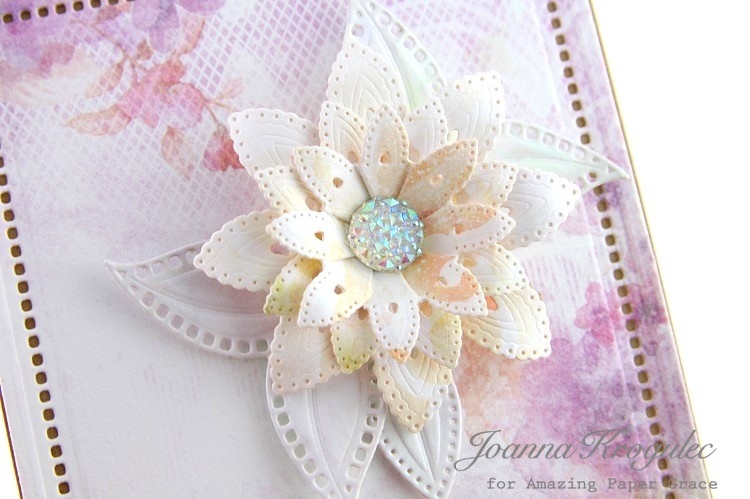 Absolutely gorgeous cards created with these fabulous new dies!! Really love the Lily Pearl die! You did an excellent job creating! Everything is just beautiful! I love how you made flowers out of the lace die. That is just gorgeous! Your cards are just dreamy! wow - gorgeous, soft, fabulous and heavenly come to mind. Just love your creative ideas with these lovely dies! 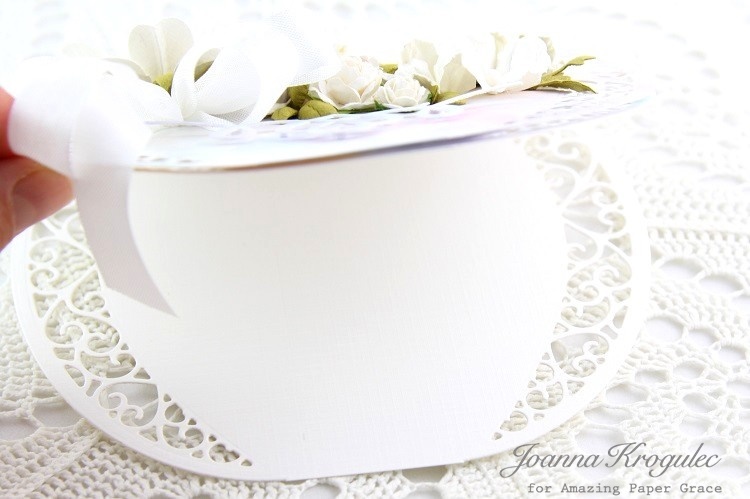 I love the new die collection Chantilly Paper Lace. Your cards are absolutely gorgeous. I love all of them and I can't wait the next one. Your creations are so beautiful. Thank you so much for showing how you made the flowers! Love the Lunette arched borders. Yours samples are stunning! Gorgeous!! Thanks for the hop! Wow! The unending creativity just amazes me.... I love your flowers, the dies are just beautiful. More things to go on my wish list! 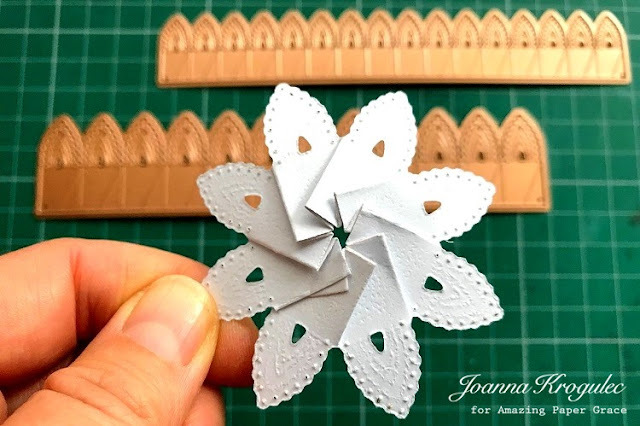 Love the arched dies but how innovative to make a die that not only acts as a border but also makes flowers. The colors on your cards are beautiful! Oh my, such lovely cards, so sweet and feminine! And such amazing new dies! Love them , especially that Lily Pearl Flat Fold Flowers, so useful and versatile!!! Oh wow Johanna! What absolutely beautiful cards. Those arched borders are especially lovely and your gorgeous flowers! Love this whole collection. Hi Joanna, your cards are lovely, especially the round one, thanks for the inspiration. Beautiful cards and love the flower. I love those colors, the cards are just awesome and the flowers perfect! Oh goodness...I'm going to need this. 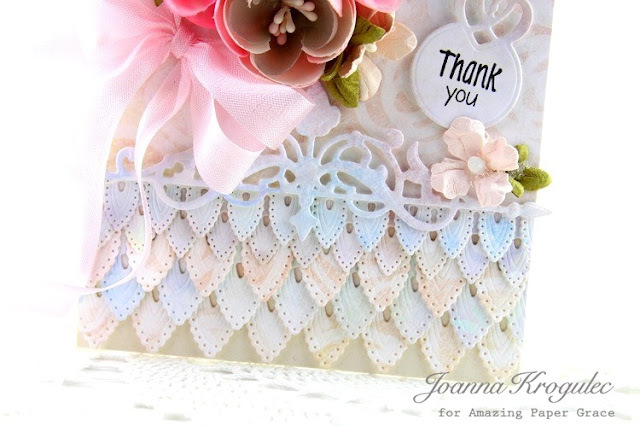 Lovely cards using some of the Chantilly Paper Lace dies. I am so excited about this group! Thanks for the clear, concise tutorial on folding. What patience you must have. I can see so many possibilities with the Lunette Arched Borders. There's nothing like them on the market and I'm EXCITED!! These are beautiful! Becca knows me to well, will have to get several from this collection. Loved your creations. Oh my Joanna, everything is gorgeous!! Your designs are absolutely exquisite!! And, your tutorial is amazing!! I really like the Lily Pearl Fold Flat Flowers. It's so cool that you can make the flowers have as many petals as you want and that you can use the same die as a border die. I love the versatility. Stunning! Stunning! Stunning! Such beautiful creations Joanna!! Gorgeous new collection! Such beautiful details on your fabulous cards! Absolutely stunning! Wow! Przecudne! A te kwiaty - bajka! These arched borders are so unique and versatile! I love how they can be used as an inset or to form a beautiful shaped card. Fabulous - your creations are awesome! Wonderful cards you have made; so feminine and elegant! Exquisite, romantic, feminine and oh so beautiful. Cards a recipient would cherish forever. As always, you created stunning projects using the new dies. Thank you for sharing the photos to create the flowers. What a sweet flower! It is difficult to choose which die I like best...especially after seeing your projects! Perhaps the arched die set. Innovative Cards! and innovative dies. Thank you so much for inspiring! Such beautiful cards Joanna! I appreciate seeing how to do the flowers too. Looking at your stunning cards makes me feel as if I jumped into the air and landed on a soft cloud in Heaven! They are so delicate and soft looking! You are a magician with Paper and these dies! TFS! Your cards are absolutely gorgeous! I love your beautiful style! Your work is beautiful and stunning ! But I like the flowers on the first card . Where are they from ? Thank you Therese. The flowers on the two first card are handmade by me. I have a tab at the top of my blog where I share a few tutorials how I make flowers. Love the dies and your gorgeous cards. Thanks for your creative ideas. 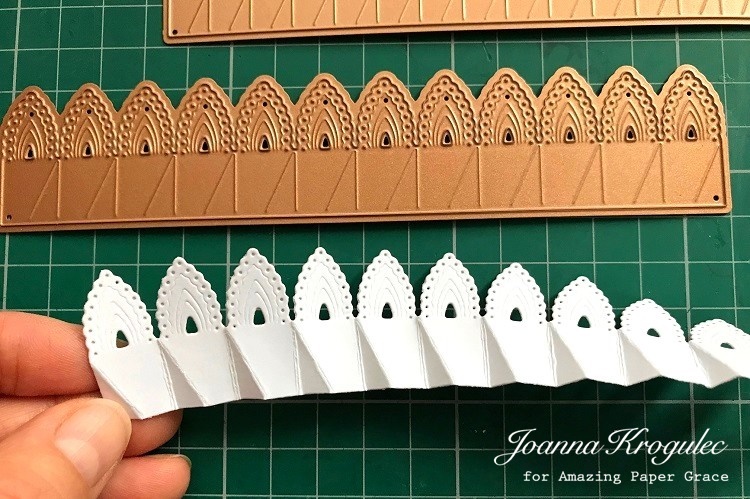 Thanks for showing us how to use those beautiful arched dies! I haven't worked with lacy dies like this before so any tips and ideas are always welcome. They are gorgeous! The hemstitched rectangles and the arched designs are so pretty and would be great to add to a crafty stash! Those rectangle dies are just enough detail to make any layer really elegant. Such delightful femininity in those lovely cards and the flower design is genius! Gorgeous & elegant! Love it all. Absolutely love the layered border card. All are wonderful but that is one I will want to try. I can never get enough of the dies that allow me to make my own flowers. It seems to be a passion of mine! Thank goodness for Becca's ability to design dies that make it so easy yet so gorgeous! Nice Blog about Laces. 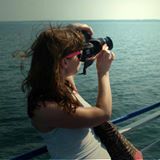 Awesome blog about laces. Thank you for sharing. What I make with my Hands I give with my Heart. Our tomorrow's start with the dreams of today. One day someone is going to hug you so tight, that all of your broken pieces fit back together.